The creation of the worldwide web at CERN 25 years ago and its introduction into culture has revolutionized the way we live our lives. It has also changed the way in which we connect, create, distribute and view new artistic work. Artists are mapping aesthetic, social and political contours of the digital world to create new platforms and connection points for their work as well as working across art forms. From virtual performance art and virtual galleries to spaces where you can pick and mix dance moves and music, the worldwide web stimulates inspiration and interconnectivity across time and space – and between other devices and platforms too. We are inviting artists from any discipline – from dance, sculpture, literature, to architecture, music and sound, performance and design – to create a new project at CERN, which uses and celebrates the creativity and interconnectivity of the World Wide Web. 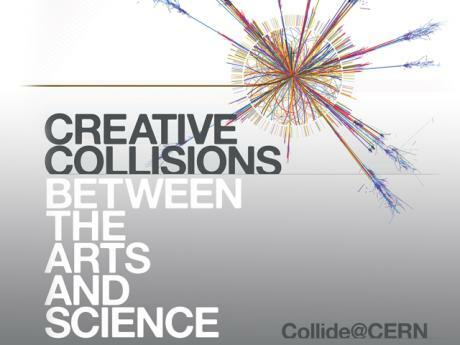 By using the ideas of particle physics as springboards of your imagination, join us by applying for the Collide@CERN residency award run in conjunction with the Swiss Arts Council Pro Helvetia, and its “Mobile – In Touch with Digital Creation” programme. Artists from any domain who were born, work or live in Switzerland can submit their proposed project until February 27th 2015. Chosen by an international jury, the laureate will spend 3 months at CERN and receive a stipend of CHF 15,000. Subsistence, travel, and living costs will be covered by a limited funded. Further information about the conditions of application can be found below. 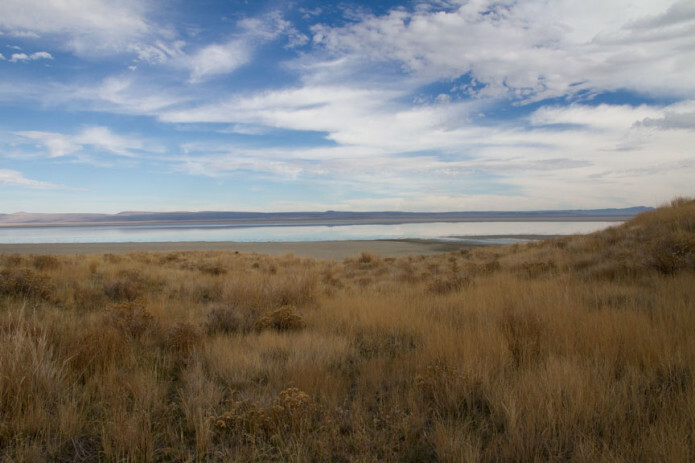 PLAYA’s residencies are open to visual and performing artists, scientists, writers, and individuals engaged in other forms of creative research. PLAYA welcomes a range of applicants–from emerging artists of promise to professionals with an established history of accomplishment. Residencies are awarded for 2, 4, 6, or 8 weeks and include housing, work or studio space, and twice weekly group dinners at no cost. There is a $35 application fee for individuals ($70 for collaborative teams) to cover administrative costs. For more information visit our website at www.playasummerlake.org. Applications are now open with a deadline of March 1, 2015. Are you passionate about safeguarding our shared planet? Love film? Want to know Scotland better? Then apply now to be part of a dream team of volunteers bringing green global cinema to the streets and glens of Scotland. TAKE ONE ACTION is an independent Scottish charity celebrating the people and movies that are changing the world, from Argyll to Zimbabwe. We believe small actions lead to big ones, and that we all make a difference. 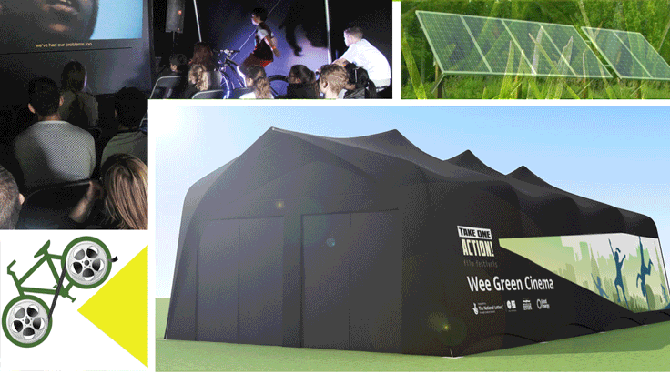 Take One Action is now recruiting its first Pop-up Cinema Squad to take our brand new bike & solar powered “Wee Green Cinema” to communities and festivals over the coming year. If you’re an outgoing, can-do adventurer based near Edinburgh, aged 16-30, undaunted by early starts, long days, Scottish weather and LOTS of fun, with a minimum of 4 weekends to spare from March 2015 to October 2015, apply now. The post Opportunity: Pop-up Cinema Team Members Wanted appeared first on Creative Carbon Scotland. In March 2015, the Green Art Lab Alliance (GALA) will be meeting for its third and final meeting in Glasgow. One of the organisations involved in this project is Cape Farewell; based in London and Toronto, Cape Farewell brings together interdisciplinary teams to generate ideas for a more sustainable future. 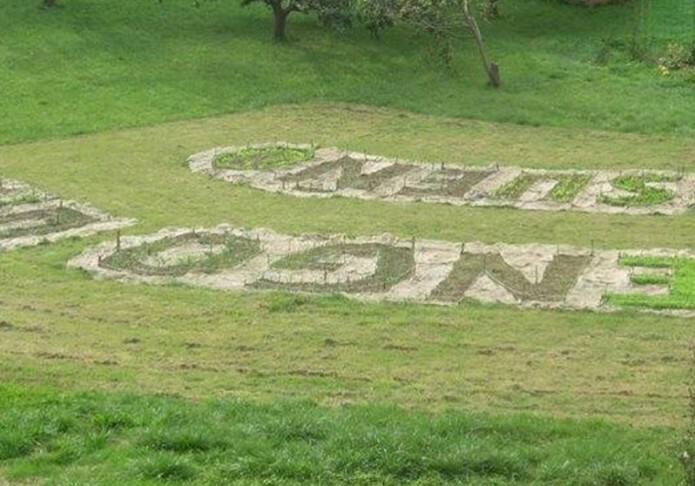 Creative Carbon Scotland recently spoke with Yasmine Ostendorf, Programme Director at Cape Farewell, about her thoughts on the Green Art Lab Alliance project to-date. CCS: What organisation do you represent in GALA and how did you find yourself involved? Yasmine Ostendorf (YO): I currently represent Cape Farewell, associate partner in the GALA project. After receiving a grant from the Mondriaan Foundation in the Netherlands to work with Julie’s Bicycle in the UK, I found myself not only wanting to establish a collaboration between TransArtists (my then employer) and Julie’s Bicycle, but it came apparent that the amazing knowledge and resources Julie’s Bicycle holds should be shared on a European level. This was the incentive for the application for the European Commission that I then prepared. After the grant was awarded I moved on from working for TransArtists to Cape Farewell, who, in the framework of the GALA project organised the Sea Change Lab. Sea Change is originally a 4 year research programme which aims to encourage knowledge exchange, celebrating grassroots and national initiatives on the Scottish islands, combining local knowledge and resources with advanced technologies and pioneering research into social and ecological resilience. These initiatives include community land ownership schemes, sustainability and heritage projects, and renewable energy, adaptation and coastal management programmes, some developed in partnership with island cultural organisations. The project also aims to extend the languages, metaphors and methodologies of participating artists, enabling them to find new and affective forms for the stories and experiences of island communities. The GALA lab, as part of this 4 year research programme, was an expedition by sailing boat to Shetland. Swiss artist Ursula Biemann was selected to take part on this expedition for GALA. CCS: What is the significance of GALA to you and how has the project contributed to your work? YO: It has been valuable to learn about the international practice in sustainability and the arts, learning about what’s happening in the other countries in Europe and how we all have different ideas about what sustainability means in a cultural context, how important it is, and what the role of arts can be in working towards a more sustainable future. Next to that is has been really interesting working with different types of organisations- from the big government funded Swedish Exhibition Agency to the small artist-led residency GeoAir in Georgia, that kind of diversity has been inspiring. Furthermore it has been valuable on a practical level tapping into the networks of all those different local partners. CCS: What is your favourite memory, moment, discussion or thought that you’ve taken from past GALA general meetings? YO: During the second meeting in Sweden we had an open seminar attended by Swedish cultural organisations and artists. TransArtists director Maria Tuerlings spoke passionately about an artist from the Pacific whose whole village was washed away due to flooding caused by climate change. She (Maria) shed a tear and it made everyone realise how pressing and real the issue of a more sustainable future is. It made the room realise this is a global, human problem we are all part of, and we can only make progress if we collaborate across borders. For me that moment unified the group. CCS: What role(s) do you think the arts/artists can play in building a more sustainable society? YO: In order to build a more sustainable society we need a cultural shift. Our excessive consumption, obsession with growth, depletion of natural resources, unsustainable food system, usage of fossil fuels etc are -at least for a big part- a cultural problem. The arts offer a space for dialogue, alternatives, a place to articulate complex ideas, and creativity and imagination is crucial in thinking about what a sustainable future society would look like. The arts allow confusion and uncertainty and create a fertile playground to spark innovation and creative solutions.What does the alternative look like? How can we fix a broken system? It allows people to think and associate freely, there is no right or wrong, things are questioned or addressed. Arts and culture allow people to engage and respond to narratives and stories on an emotional level, creating deeper levels of engagement and therefore it is more likely to instigate long term, intrinsic change. CCS: What are your hopes for the final GALA general meeting in Glasgow this coming March? YO: Taking into account the urgency of the topic we need to be making further international links and think about building relationships, or ‘knowledge alliances’, with places like Asia and Latin America- influential, growing economies where sustainable practice could and should be central to further development. These are areas of crucial importance if we want to instigate change on a global level and areas from which we- Europe- can learn a lot from, for instance about our relationship with the natural world. For GALA I think it would be great to keep on collecting and showcasing inspiring arts projects in the different countries of Europe. We need to keep on supporting and facilitating these projects. These best practice projects could lay a foundation for influencing policymaking as I think a next step should be to engage governments, the EU, policymakers and funding bodies. To make a strong point we need to collaborate as countries, as artists, as people. Image: Away with the Birds / Air falbh leis na h-eòin by Hanna Tuulikki, part of the Sea Change programme by Cape Farewell. Photo: Alex Boyd. The post GALA Member Spotlight: Cape Farewell appeared first on Creative Carbon Scotland. The inaugural meeting took place at the Jan van Eyck Academie in Maastricht, Netherlands. 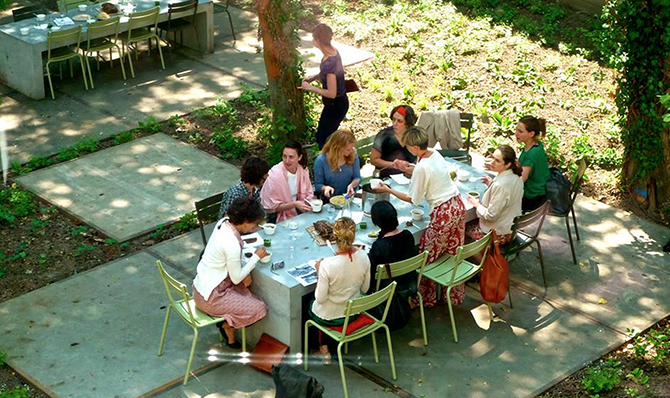 By bringing the project’s international partners together, this meeting allowed for collaborations and connections to be forged between like-minded organisations looking at the myriad possibilities for artists working within the context of sustainability. Discussions began with keynote speaker Catherine Langabeer of Julie’s Bicycle introducing JB’s work, moving onwards to a “wishes and challenges” brainstorming session, along with project presentations by all of the GALA partners. Projects that GALA partners are involved with range from an artists’ lab treehouse in rural Abruzzo to an online platform that connects the artists’ networks of Europe and Asia. Though this meeting took place nearly two years ago, the linkages and ideas formed around this network have come to play a critical role in the development of arts and sustainability projects across the world. With the final GALA meeting coming to Glasgow in March 2015, it’s imperative to reflect on the progress that has been made through the opportunities presented by GALA. More information and full details about this first meeting can be read on the TransArtists website. The post Reflections from the first GALA general meeting appeared first on Creative Carbon Scotland.